It’s been snowing in Rossland. Red’s claiming 58cm in the past week ,so I thought I’d give it a try. With racers busy lapping the strip of fenced-off man-made snow on the T-bar, Red was looking as though it might have enough coverage so I started up the face. I was soon sinking into the bushes, so veered back towards the T-bar, eventually being drawn to the bare strip that had been excavated for the snow-making water-line. 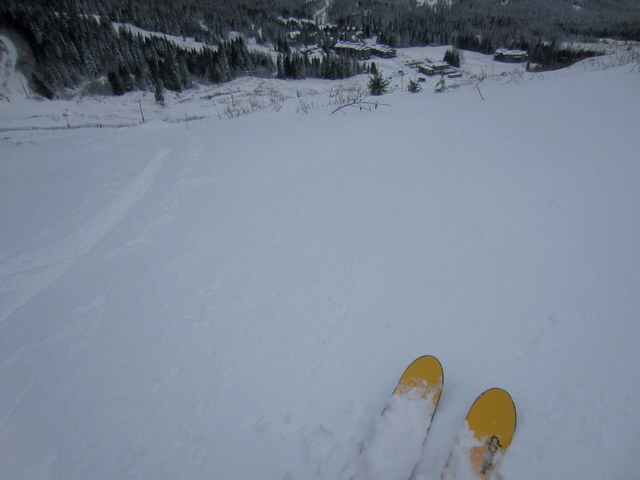 I skied from part way up back-trail, and by staying light avoided punching through to dirt. With significant snow in the forecast, it’s only going to get better.